Form 10-Q - What Does It Mean? 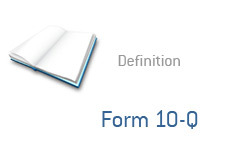 What is a form 10-Q? What is the definition of 10-Q? Why must companies file a 10-Q? The 10-Q is a quarterly report (hence the use of the letter Q) that publicly traded companies are required to file. The 10-Q is not to be confused with the 10-K, which is an annual report that includes the company's audited financial statements. Why are there not four 10-Qs filed by companies each year? Why only three? The answer - information on the final quarter is contained in the annual report, making only three 10-Qs necessary. The Form 10-Q must be filed within 30 days of the end of the quarter. The Form 10-Q is filed with the SEC (US Securities and Exchange Commission).